When it comes to having a successful business, there isn't much that more sales can't fix. Selling is an integral area of every business that needs continual development and training. If you don't have a strong sales system in place that is supported by a motivated and skilled team, your business is almost guaranteed to struggle. Unfortunately, there isn't a magic sales wand we can wave around that will make this happen instantly. There is one way to ensure your business starts to make more sales, and that is through creating a solid sales system suited to the culture of your business and the nature of your industry, whilst training your team with the right attitude and skills to support that structure. 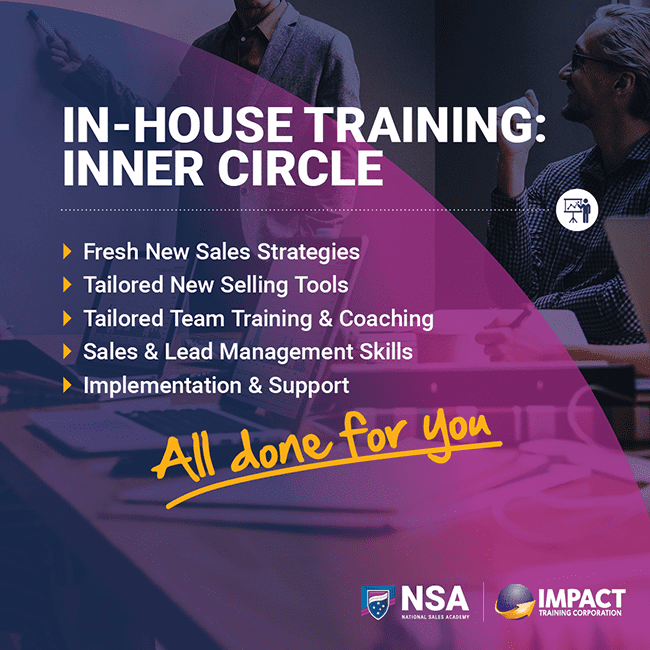 Through our Sales System Health Check, our team of experienced sales and business experts will help you claim back full control of your business and give you a clear understanding of what Sales Training needs to be done in your business to create the success you want. Over 100 Mazda sales consultants from across the country took part in the program. Feedback from the team was overwhelmingly positive. Many of those who participated felt the skills taught by the NSA were invaluable to their role and easy to implement in any scenario. Increased sales confidence was the first result, an overall boost in sales averages quickly followed. Any company that wants its sales team to consistently use a methodology that works, should definitely be talking to the NSA. The NSA trainers went out of their way to ensure I had the most effective strategies to instruct, build momentum and constantly motivate my team. I am now confident in coaching and am able to help team members in any sales situation. The lessons I learnt have also translated into my new role as Training Captain. I am a more confident decision maker, a clearer communicator and a captain who leads by example. Previous to Sales Mastery we did not have formalised sales processes, our techniques were old and our approach was aimless. The NSA enabled me to put a process tailored to our industry in place, which measures everything from outgoing and incoming calls to meetings and researched prospects. We now have valuable data and are able to create reports that identify peak performers and those who may need extra support. Sales have increased as a result of the NSA’s systems and we now induct and train staff based completely on the manual provided by the NSA. The NSA taught me the power of communicating correctly to current and potential clients. Developing rapport through the strategies I was taught has enabled me to communicate my service as a long term investment to clients, keeping them up to 50% longer. For business owners looking to build a service based business there is nothing more important than developing consistent systems and sales processes. The cost of the course was paid for after only one or two sales but the advantages just keep going. Results were immediate and not just limited to sales. Our relationships are based on an understanding of body language, personality traits and the ability to approach all types of people accordingly. Presentations to clients and potential clients have completely changed… The NSA's Behavioural Profiling Disc is now also a solid part of our recruiting system. We are able to effectively employ the proper people for specific roles based on these teachings. To schedule a complimentary Sales System Health Check, click the button below and enter your details. Then one of our Sales Business Experts will be in contact with you soon.